Burn up to 900 calories per hour! Tone and strengthen muscles through the entire body, and drum your way to a leaner, slimmer physique – all while rocking out to your favourite music! Improve your coordination, rhythm, and timing. Increase your agility, endurance, and speed. Instead of counting reps or keeping track of the clock, POUND® strategically distracts you from the high-intensity and duration of your workout, and shifts your focus to rhythm and volume. This immersion is responsible for the addictiveness of POUND® – the reason you can’t stay away! Each 2-4 minute song is carefully calibrated with interval peaks and extended fat burning sequences, providing you with the best workout in the shortest span of time. 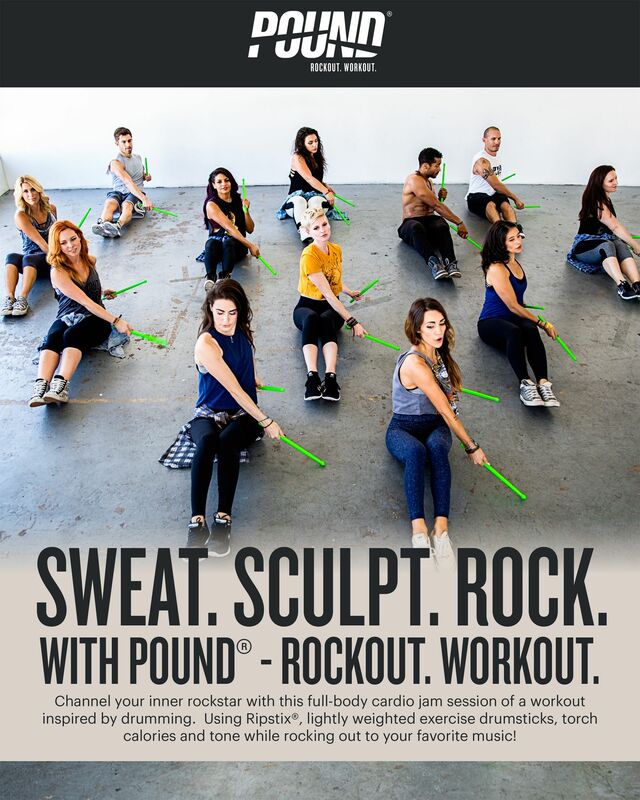 After you’re done rocking out in a 45-minute POUND® class, you’ll have completed up to 15,000 reps, performed over 30 extended interval peaks, and zipped through more than 70 techniques without even realizing it.